The monks of the Order of Cistercians organised the settlement of Nagytevel (German: Deutschdorf) with German settlers. The contact between the settlers and the monks in the village close to Pápa (German: Poppa) was friendly and democratic. Many of the monks came from humble families of farmers and craftsmen just like the settlers. They shared the same fate and lived after the motto: “The first generation works themselves to death, the second suffers and only the third will harvest”. The close knitted community of Nagytevel was one of a kind. The Order of Cistercians was known for their modern and progressive agricultural knowledge and methods. Nagytevel was their model farming ground and they shared their skills with the settlers. The Cistercians’ ensemble of Roman-Catholic church, Calvary, Holy Sepulchre, Meierhof (administrative building of a parish) and a two-story dominium are a main sight of the village. Opposite the church, the Meierhof, seat of the abbey’s administration, can be found. Today, it is used as an exhibition space and the local heritage museum. Dr. Gyula Schweighoffer is well known in the village as a collector of religious and secular German songs. It is thanks to him that many songs have been passed down in the regional dialect. 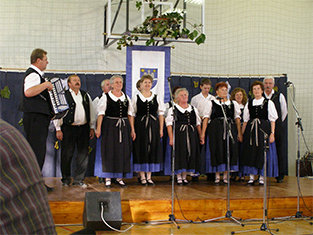 The German choir “Tewlana Liederschall” (Tewlana Sound of Songs) sings songs from this collection of songs and the German folk dance group, which is led by the married couple Obermajer, is performing traditional dances in their local blue costume. 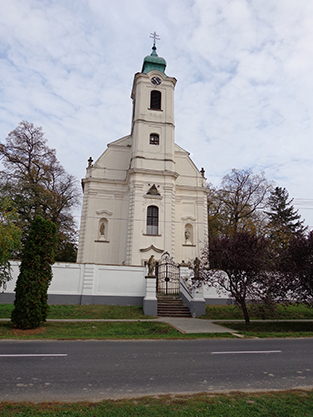 Roman-Catholic church, established by Cistercians from Zirc.